Like all kids, I loved Scooby-Doo when at school. The classic Hanna-Barbera cartoons were some of the most iconic in the history of animation, and when it comes to his movie appearances, he has a lot of entertaining stuff on offer as well - and no, that doesn't include those live action dog turds. 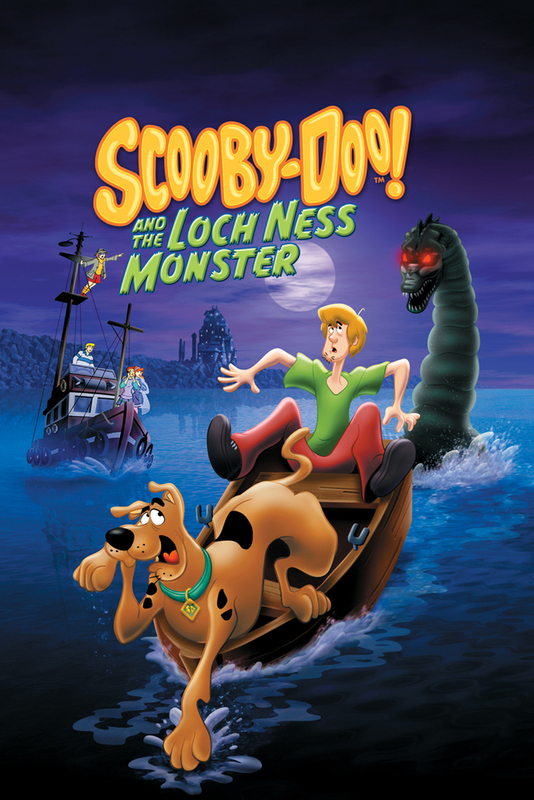 Mystery Incorporated's journey to Loch Ness in 2004 was one of my favourite animated flicks as a kid, and it's still a funny and zany little adventure to this day. 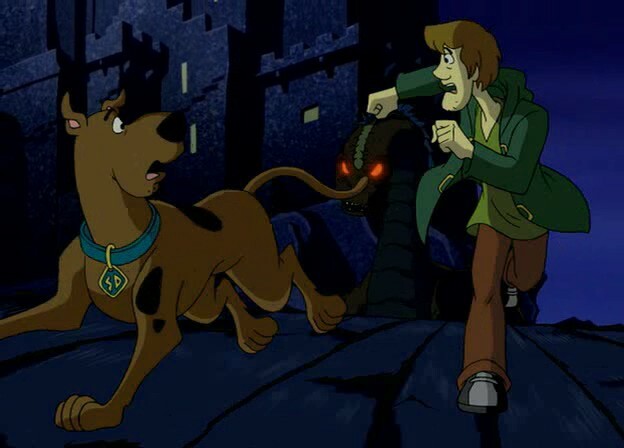 As with all Scooby-Doo narratives, one must put aside reality and a large amount of common sense for the entire duration; however, at times, all your disbelief must be suspended to the point where it may be impossible to recover once the film is over. Some of the plot gets kinda absurd as it goes on, enjoyable as it is, so let's have a gloss over some of the strangest errors. One of the Loch Ness Monsters turned out to be a giant wooden puppet thing controlled by Colin and Angus, done so as they wanted to scare away other athletes in order to win the games and because they found it amusing. However, when you witness the strength, agility, and sheer lifelike nature of the creature in previous scenes, to believe it is two teens controlling a bunch of logs decorated in a scary lizard like pattern is just insane. Adding to this, notice how when they chase Shaggy and Scooby, they violently drop down from the Blake Castle cliffs into the Highland Games field, their Nessie machine thing totally unharmed after doing so. However, they are later tricked into falling down a small trap hole and, once they do, the entire thing is smashed to pieces. How did that happen? On the subject of that, why did neither of them face any legal repercussions for committing these actions? They completely and utterly smashed apart a place of historical significance and architectural importance, as well as, you know, a family home. In the end, their justification is that they enjoy a good ol' practical joke. In reality, I'm sure a gargantuan fine and lengthy prison sentence await, once the Judge gets his/her around how nonsensical their actions were. Professor Fiona Pembrooke is equally guilty of such offenses, creating a mechanical submarine Loch Ness Monster of her own in order to convince Sir Ian Locksley that the creature is real. Once exposed, her actions are laughed off with the typical "meddling kids!" quote, when in actual fact her crimes almost render her, like the teens, a domestic terrorist. In a stupid way, though. Still, she gets off quite well considering. The technology used to create the submarine monster must've cost a fortune and taken incredible effort to build. However, it is never explained how Professor Pembrooke managed to create it. She must've done so herself, otherwise other people would've known of her plans. How did she do it? Where did she do it? How did she afford it? How and where did she perform test runs to ensure it ended up working to perfection without being noticed? Come on. We can say the exact same thing about the wooden puppet thing made by the teens, but in some cases that's even less comprehensible, considering how much more difficult it must've been for them to get it to work properly. 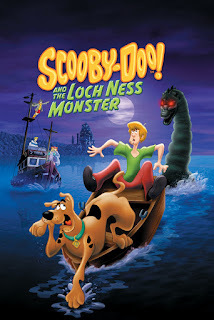 When Shaggy and Scooby are being chased by Nessie for the first time, they somehow survive sliding down a huge cliff and crashing onto an open field in a ruined castle tower with no means of restraint or protection. Without any injuries whatsoever, actually. It takes the other folks at Blake Castle a worryingly large amount of time to come to Shaggy and Scooby's aid when they are being chased by Nessie amongst the Highland Games field, considering all the smashing and roaring that was going on. They also show very little concern for a large portion of the castle being smashed to pieces (in fact, nobody acknowledges it) and somehow don't catch a glimpse of the enormous brown lizard walking away from the field towards the town. You'd think they might've done so quite easily if running all the way down from the high cliffs beside the castle, with a perfect view of the field below them. Professor Pembrooke's land and sea models of Nessie have feet, are brown with bright red eyes, and have no fins at the end of their tails, which is surely not ideal when trying to prove to Sir Locksley that Nessie is real. You see, she wanted him to be convinced all along, so if her plan worked, he'd of course have a look at her photos - which show the creature as a greenish brown colour, with flippers instead of feet, and a tail fin. Even if Sir Locksley did believe her before the Mystery Inc. team solved the case, Pembrooke was always going to be exposed as her fake Nessie monsters look nothing like the small glimpses of the real creature in her photos. Why am I bringing so much logic into this movie? Sometimes it's fun to see how different films would be if even a glimpse of common sense was present. While this film is certainly good fun, it sometimes just asks you to stretch your imagination a little bit too far. A talking Great Dane with a lust for all kinds of human foods is easily more convincing than some of this aforementioned nonsense.